I have long wondered why churches weren’t being more active and vocal about the need for environmental and ecological controls over God’s earth. In the early 1990’s I read a book (God is Green) that opened my eyes to this issue. Now, John Grim and Mary Evelyn Tucker, leader figures on this issue, have written an authoritative work on the intersection of Ecology, Religion, and Ethics. Ecology and Religion is an exhaustive account of the needs for the various organized religions to step forward and take charge of world-wide ecological issues, and also details the work that’s been done, along with the various world council meetings to discuss world ecology. This is an important book and anyone with an interest in the world’s health and future (and that should be all of us), or an active member of any church, should make this required reading. We’ve left the maintenance of the planet up to the politicians long enough and only the power of the pious can possibly prevent further catastrophe. The book does get a little dry in the reading and it took me a while to get through this, but I DID keep coming back to it because of the issues it discusses (which are important to me), and there is a lot of information here. This might not be for the casual reader with an interest in the subject, but rather for the student (of any age) or professional. One thing that I was hoping to find was more hands-on practices for the lay person. What can I do to help the ecology, in the name of a religion? Judging from this, it would be to attend some conferences. But I suspect there is more to it, this simply is not the guide. It is, however, the comprehensive report on what is being done on a global scale. Looking for a good book? 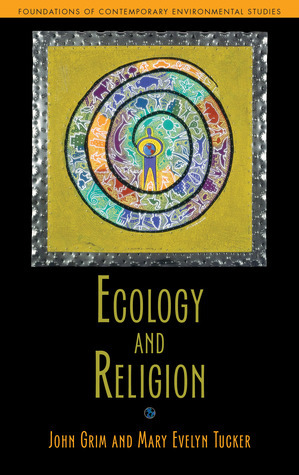 Ecology and Religion by John Grim and Mary Evelyn Tucker, is a thorough look at the global, religious efforts and world ecology and is a must for serious students of the issue. I received a digital copy of the book from the publisher, through Netgalley, in exchange for an honest review.